No, not to make way for masses of new clothing, but to see what you actually have. Many women have overflowing closets and drawers full of stuff they haven’t seen in months, even years; It might be that you can ‘refresh’ your wardrobe for the season without ever having to buy a single thing at all! It has never been easier to find discounts on high-quality clothing than it has right now. I mean you can find countless Urban Outfitters codes on DontPayFull, money off SurfStitch at Finder.com.au and literally hundreds of other great deals on fashionable clothing right now. All it takes is a little research, and you could restock your wardrobe for a fraction of its true worth. 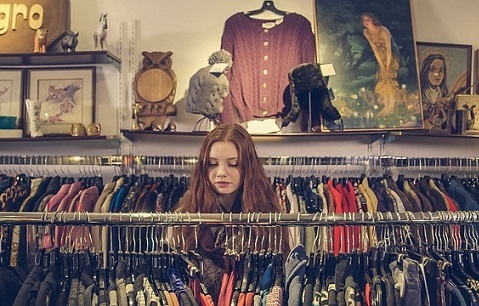 Did you know that the stuff at the front and in the centre of any clothing store is likely to be the most expensive? If you’re on a tight budget, it’s best to avoid them, and the temptation they bring, altogether and head to the back where you’ll find more affordable fashions. You can pick up a second-hand sewing machine for very little – you might even be able to find one for free – and there are lots of free sewing and dressmaking tutorials online, so why not take advantage? Once you’re equipped, you can start cutting up old dresses to make new ones, adding embellishments to the stuff you have and buying cheaper fashions that you can then turn designer with your own additions, too! A lot of people turn their nose up at this, but you can find some really amazing vintage fashions that will blow the stuff you’ll see in the ‘proper’ fashion stores out of the water these days. This is even more likely if you visit op shops in richer neighbourhoods, where it wouldn’t be unusual to find designer items for just a few dollars if you get serious about searching. Another way to update your wardrobe without spending a single cent is to try out new combinations. You might never have thought of wearing that top with that skirt, or those shoes with those shorts, but experiment and see what happens. If it works out, you could have a whole ‘new’ wardrobe to work with. Get a bunch of your friends together and have them bring a few pieces of clothing they no longer want, you do the same and voila – you all have updated wardrobes without having spent any money at all! If you want more choice, make it a community thing! I hope this helps you put together a really great wardrobe without straining your wallet!